Isn’t she gorgeous? A spineless dwarf variegated beauty! We spotted this Variegated Dwarf Pandanus at a garden nursery in our neighbourhood in late December 2015. Believe me when I say that we were indeed smitten by its stunning yellow-green foliage variegation. A must-have plant to be added to our garden collection. Unfortunately though, there were several plants, about 45 cm tall in a large container and cost RM45. That was way beyond our garden budget. Thus, I pleaded with the owner of the nursery to dig out a single plant and charge me accordingly. So very happy that he ordered one of his nursery helper to spade out one plant as requested and charged us only RM10. It’ll be just great in a container. 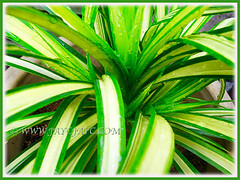 This plant is unlike the fragrant Pandanus amaryllifolius (Pandan Leaf) that is popularly used for culinary purpose. 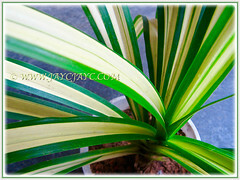 Botanical Name: Pandanus veitchii ‘Variegata’. Common Names: Variegated Dwarf Pandanus, Variegated Screw Pine, Variegated Veitch’s Screw Pine. Origin: Pandanus veitchii or Vetch’s Screw Pine is native to Polynesia, whilst Pandanus veitchii ‘Variegata’ is a cultivar. 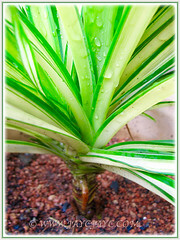 Features: Pandanus veitchii is one of the many species in the genus, Pandanus which has over 600 species. A hardy, evergreen and moderate-growing tropical perennial, Pandanus veitchii ‘Variegata’ is a cultivar with an upright-growing habit. It can reach over 1.2 m tall under good growing conditions. If container-grown, it’ll be compact and dwarfish, about 60 cm in height. This Variegated Dwarf Pandanus produces non-fragrant foliage that are spineless. The strap-like leaves that are arranged like a rosette are beautifully cream-coloured in the centre with green variegation on the margins and a couple more striations. As the basal leaves wither and are removed, its stem will develop horizontal leaf scars left by shedded leaves. 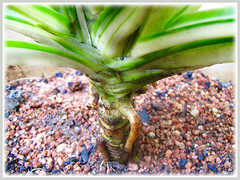 Variegated Veitch’s Screw Pine will develop stilt roots with age. This plant does not flower. 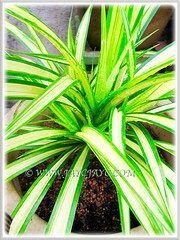 Culture (Care): Pandanus veitchii ‘Variegata’ or Variegated Dwarf Pandanus grows easily with least maintenance. Keep the foliage dust-free by wiping them with a wet cloth. Feed once fortnightly or monthly with a balanced liquid fertiliser for optimum plant growth and foliage variegation. No known serious pests or diseases though do watch out for mealybugs, aphids and mites. For subtropical and temperate regions: Hardiness: USDA Zone 10-12. An eye-catchy perennial in hardy regions. It is not frost tolerant. 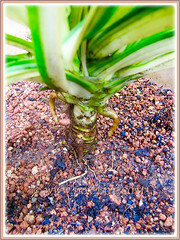 Pandanus veitchii will develop stilt roots with age. Just cover the roots in soil again to secure the plant to be upright and strong. Water regularly during the growing season in summer but reduce gradually after. Feed once fortnightly with a balanced houseplant fertiliser from spring to summer but once monthly in winter. In non-hardy regions, they are grown as houseplants and best to be grown in pots so that you can overwinter indoors and bring them outdoors once the weather is warm. Provide bright light, warmth and humidity if grown indoors. 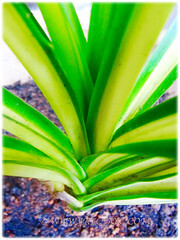 Propagation: By removing the suckers or plantlets that emerge from the base of older plants. 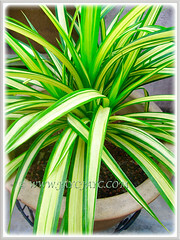 Usage: Pandanus veitchii ‘Variegata’ or Variegated Dwarf Pandanus with stunning variegated foliage will make an excellent ornamental specimen in any garden. 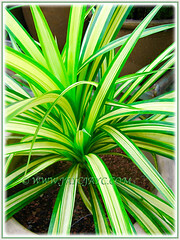 A captivating plant that provides the ultimate tropical look for your garden. Most ideal for gardening in pots and raised planters. Great as an eye-catchy houseplant for indoor decor, especially in non-tropical climes or located at patio and deck, outdoors.